Froggs Leap is and adjoining studio to Arum Cottage which can inter-lead into the cottage if needed. It is an open plan unit that is semi self catering with a microwave, toaster, kettle and bar fridge. It also has a double pull out couch for smaller children if necessary. It has a shower en suite. This unit is perfect for a couple or for the grandparents of the family in Arum cottage. Constantia Lazy River is centrally located in the oldest wine area in the Cape. Set in a quiet cul de sac it has wonderful views of the mountain. The units are situation around the main house with a wonderful garden for kids with slide, jungle gym, swings, trampoline, barbecue facilities and shared pool. 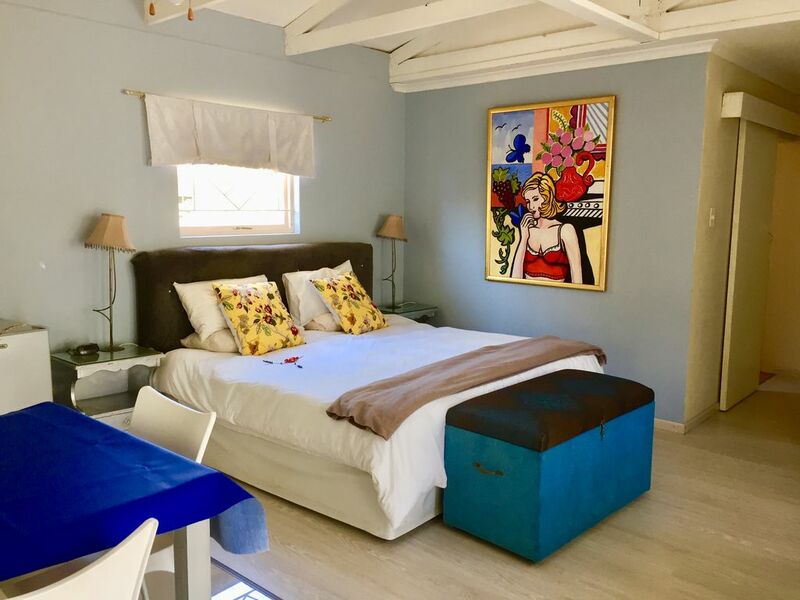 All units are self catering with private entrances, units are serviced, have secure parking with remote for gate, wireless internet, security, 1 min to Constantia Village shopping Mall, and fine family restaurants, 1 min to Constantiaberg Hopital, Virgin Active gym, walks and hikes, 10 min to both the Atlantic and Indian Ocean, 15 to Cape Town central and 10 to Kristenbosch Gardens. Constantia is home to Groot Constantia wine farm as well as Uitsig, Klein Constantia and Buitenverwagting. Lazy River is very child friendly where families can feel welcome and at home. Babysitting on request. All units have safes, hairdryers, fans and panel heaters. All have kitchen facilities. My parents bought the property in 1945, it was part of 5 acres and there were lots of horse riding schools in the area. Constantia Lazy River was part of the old stables. We border on the greenbelt and face the back of Table Mountain. I have lived here all my life and love Cape Town and South Africa. I come from a show business family . My father brought many famous artist to perform in South Africa. I therefore have a strong appreciation for the Arts, the theatre etc. We love animals and love long walks on the beach and the mountain with them. We are out door type people who are down to earth and love nature, camping and family Sundays. I love being a guest house owner as I love people and all there stories. We cater for families, corporates , singles, honeymooners etc. The units are spacious and cater for longer stays, there is a play area for kids and a big sized pool for summer months. Each unit is private with their own outside area with barbecue. Parking inside premises. Quiet and close to shops and restaurants. Fantastic views, family friendly, self catering which is easy for guests that want to be private, but also safer as there are always people on the property. Very central to both oceans and all the major sites, on the door step to all the wine farms, close to shops, hospital and gym. Fantastic restaurants in the area, up market and leafy and green, lovely walks, cycle routes, mountain views, greenbelts and open spaces.